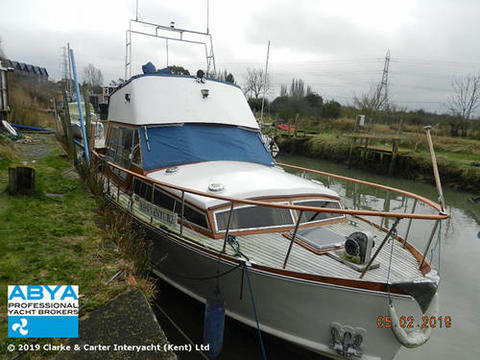 Classical boat with excellent exterior space, good deck. 2 Cabins layout with 1 Bathroom. 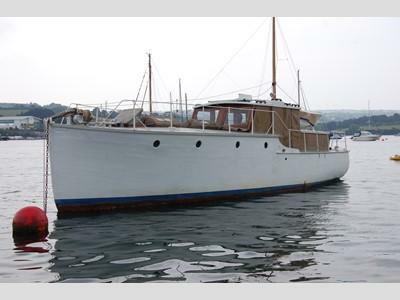 In the bow, big cabin with central double bed, wardrobe, finishing in wood. Good size salon, with central table convertible into bed and L-shaped sofa at port side. At starboard, cabin with 2 bunks, wardrobe and storage zones. Also at starboard complete bathroom with Hot and cold shower, electric toilet, sink and several cabinets. At port side full galley with stove and oven, fridge, sink, drawers, cabinets and wine bottles storage. In the aft at starboard side helm station with steering wheel and electronic equipment. At port in the aft, L-shaped sofa and wide space. Spacious cockpit with teak floor, removable cockpit table, chairs and rigid bimini. Access to swimming platform through door. Davits and cockpit shower. GPS/Plotter, Autopilot, Bow-thruster, Depth sounder, Speed/Log, VHF with DSC, 3 Electric Bilge Pumps, Battery charger Mastervolt, TV antenna, Shore power, Electric Windlass, Battery monitor, Hot water.